Seven years ago Kallie woke up in a New York City museum, injured and traumatized. Alone and unclaimed. Despite her shattered memories, she’s worked her way into a position as assistant curator in that very museum, and now she wants nothing more than to pursue funding for her project–assembling pieces from the ancient Minoans. But then the blackouts start. Lost time, stranded in terrifying danger, frantic visions that can’t be real. A threatening phone call may be nothing more than paranoia and madness. Or perhaps not. It’s time to start seeing her psychiatrist more often. Kallie’s doctor challenges her to keep a journal, but her writing morphs into something else… What begins as a romantic fairy tale becomes an allegory of a woman plunged into crisis in the ancient past, in the misty islands of Minoan Greece, home to myth and legend. When a mysterious billionaire invites Kallie to scour the black market with him for the most valuable of all Minoan treasures, the key to their lost language, Kallie can’t resist. Dimitri is wealthy, charming and good-looking, but she’s not interested–not in someone who’s clearly hiding secrets of his own. Together, the two embark on a global quest to find the Key, through some of the most exotic and beautiful locations in the world–unraveling the mystery and pursuing leads, all the while resisting romance in Italy, under the Santorini sun, and among the pyramids of Egypt. Meanwhile, Kallie’s memories are bleeding through and her journal has turned violent. She’s teetering on the verge of a breakthrough, but what devastating truth has she been suppressing? When a strange woman who clearly knows Kallie’s real identity tries to murder her, it’s clear that Kallie’s past and present worlds are colliding, in a deadly crisis that will finally reveal the shocking mystery of her past. But will the truth leave room for love? Seven years ago Kallista Andreas woke up in a New York City museum with absolutely no recollection of how she got there or who she was. The museum’s curator, Judith, helped Kallie get back on her feet with a job—even named her after an ancient city. Even though she is comfortable in her new life, Kallie can’t help but feel the empty ache of her past everywhere she goes. She feels like she is going crazy when the blackouts begin, along with scary hallucinations that feel incredibly real. Then Dimitri Andreas—a charming and wealthy philanthropist—offers to give her a team on a search to find the most valuable Minoan treasure called the Key. Despite knowing it could be a dangerous quest, Kallie can’t resist and thus begins the grand adventure to find the lost Key and, in the process, find herself. I read The Queen’s Handmaid last year and fell in love with Tracy Higley’s poetic writing style and her full-of-life characters. This book reminded me again of why I should read more from this talented author! Awakening was the perfect blend of past and present, legend and reality. It had global adventures, intriguing mystery, soulful romance, and suspense that kept my eyes glued to the pages. I thoroughly enjoyed it! Usually I don’t like books that blend two different stories, but surprisingly I wasn’t bothered by this one. Probably because I really enjoy history. My only complaint, and the reason I didn’t like this one more, was that sometimes the writing was maybe just a little pretentious. I had a hard time with the flowery words in the side story, but that could’ve been just me. Other than a few minor quibbles, I have to say that it kept me intrigued enough to finish within a few hours. The ending was predictable, but beautifully told nonetheless. 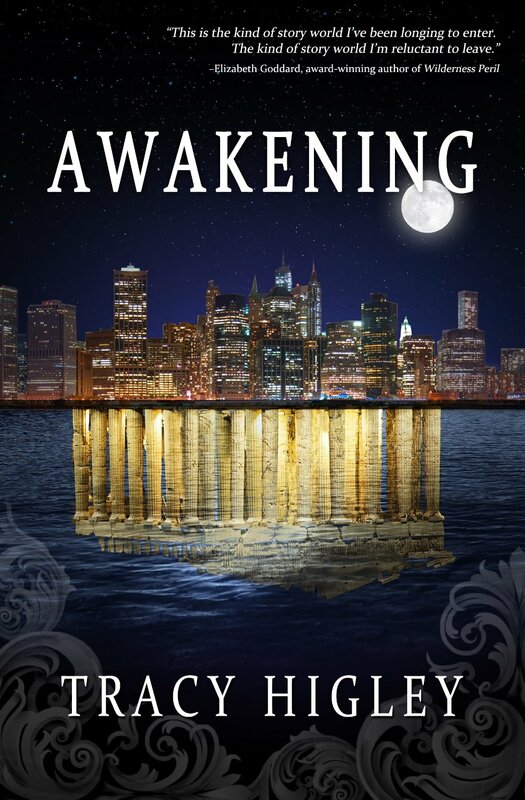 Have you read Awakening? If not, is it on your to-be-read list? Which Tracy Higley book is your favorite?